As I mentioned yesterday, Jason and I made Wednesday more special. Not just another evening of rushing to get dinner done, sitting and blogging, or staring at the tv. We went to a wine bar downtown called ZIN Urban Wine Bar. On Wednesday nights they have a wine tasting that they do: 5 pours for $15. Jason immediately went with that option. I, however, am not as adventurous, so I stuck with a safe glass of white - Acrobat, King Estate, Oregon Pinot Gris. I did taste each of Jason's selections though. All were pretty good, even the chardonnay was drinkable, and I don't typically care for them. I was surprised at how much I ended up like a Pinot Noir Rose - Schug. Honestly, I have never had a Rose. This one almost reminded me of the Louis Tete Beaujolais Nouveau (which we can no longer get here sadly). It was very light, dry, low-sugars. Anyway, I just stuck to my one glass, and after Jason finished his tastings, we headed home to make dinner. We had been sort of debating about what to make over the wine. 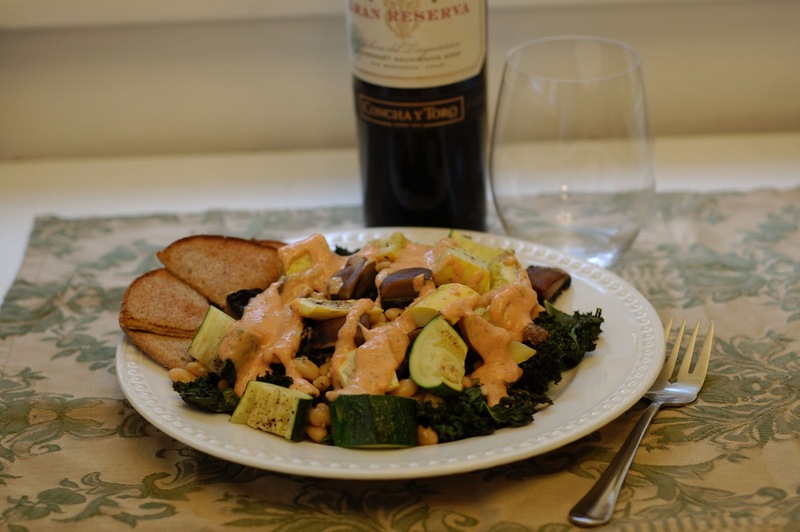 We ended up settling on a roasted kale salad with roasted squash, zucchini, and portobellos. I heated up some cannellini beans with garlic, a little vegetable broth, salt, pepper, thyme, fresh basil and oregano and let that simmer until all liquid was gone. For a dressing, I simply blended together silken tofu with roasted bell peppers, almond milk, red wine vinegar, lemon juice and seasonings. We decided to eat dinner and watch the Chronicles of Narnia Prince Caspian. However, we realized right away that we had already seen that one. I guess we had both added it to Netflix. We watched it anyway. It was definitely better than flipping around the tv channels. Today was a rest day for me. Though, I'll admit that I really really wanted to take my new Brooks Ghost 5's out for a test run. But, the DOMS finally set in from Tuesday's leg circuit, and I'm planning my long run in the morning. So, instead, I plan to spend some time stretching and rolling while watching Food Network. Jason went to an evening swim class, so I have the house to myself again. I plan on just making a loaded sweet potato for dinner and painting my nails - they're in sad shape right now. I do have a few house chores to get done because I have a guest from out of town staying Saturday night. But other than that, I plan to take full advantage of my rest day.